Not long ago, I expressed the wish that pundits and political reporters making prognostications about the 2012 landscape in particular states would pay more attention to factors unique to the various swing states, rather than relying simply on polling data and unemployment figures. I used as an example North Carolina, where, it seemed to me, pundits ought to be paying more attention to the remarkable success that conservative moneybags Arthur Pope has had in shifting the state right, not least by spending millions to help flip the state legislature to the GOP last year. Jonathan Bernstein offered a good rebuttal, to which I granted one point and contested another. Today, though, comes a reminder of the other reason that reporters really ought to pay closer attention to what's happening on the ground in the swing states: it's more fun! Specifically, in this case, it's another excuse to talk about Rielle Hunter, the blonde New Age aficionado who apparently decided that being the model for the protagonist of a Jay McInerney novel was not sufficiently notorious and decided to write herself into the annals of the national Democratic Party as well. Here's the deal: Pope's heavy spending on last year's legislative elections in North Carolina had a broader goal in mind, getting control of the state's congressional redistricting process. And lo, the new Republican-controlled legislature has redrawn district lines to the extent that Republicans are now expected to grab four more of the state's congressional seats next fall. One of the sharply redrawn districts, the 13th, throws together two Democratic incumbents, Brad Miller and David Price. And the list of Republicans eager to take them on and capitalize on the new lines just got a new entrant: U.S. Attorney George Holding. 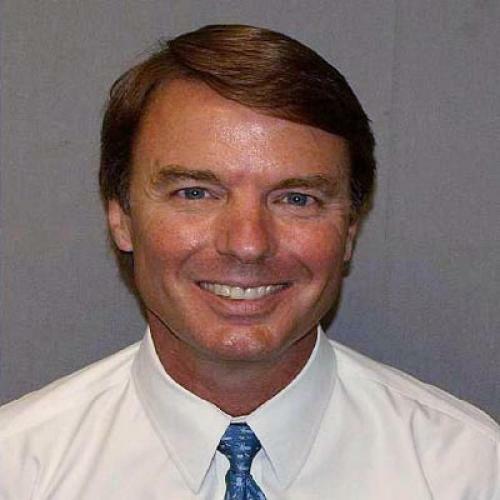 That name probably doesn't mean anything to most of you, but it does to John Edwards. Holding is the man who decided that there was serious federal offense in Edwards' creative and desperate efforts to keep secret his affair with Hunter, his campaign's erstwhile videographer, and her pregnancy with his child. Holding's office charged that Edwards broke federal campaign finance laws by funneling to Hunter tens of thousands of dollars from two top supporters. The charges raised eyebrows among many experts in campaign finance law, some of whom wondered whether Holding, a Republican who hails from a major banking family in the state, was motivated partly by politics. That Holding, who has since taken himself off the Edwards case, has now thrown his hat in the ring for the congressional seat, reports Politico, has only strengthened the hand of those seeking to dismiss the Edwards' charges as Tar Heel partisan gamesmanship. As it happens, Edwards is in a Greensboro court today for a hearing on the case. No word yet whether he raised Holding's new role in the Pope-driven makeover of the state political landscape as an argument in his favor. But it's quite the tangled web North Carolina has weaved. Reporters should count themselves lucky that this state will be the site of what could otherwise be an awfully dull 2012 Democratic convention.